10 days from £2630pp plus international flights. This is a classic mix of safari and beach, combining busy days wildlife spotting in Liwonde National Park with time to chill on an island in Lake Malawi. This is a 10-day gem of a holiday to this beautiful country. Malawi is small and you'll travel by road, allowing you to view varied scenery and catch a glimpse of village life. Once at each destination you'll have plenty of time to settle in, with 4 nights at your safari camp and 5 nights on the lake. Accommodation is comfortable rather than luxurious, and the friendly service and smiling faces of the staff will soon make you feel right at home. Both are child-friendly and this is an excellent family holiday. Safari activities are varied, with a choice of 4 x 4 game drives, night drives, boat trips and guided walks all led by experienced guides. At your rustic but comfortable camp on a tiny island on Lake Malawi you can choose to simply relax, or go swimming and perhaps try snorkelling or kayaking. Your flight arrives into Lilongwe where a representative will be waiting to meet you and drive you to Mvuu Camp, which will take 4-5 hours. The camp is on the banks of the Shire River in Liwonde National Park. 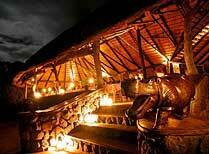 At the heart of the camp the thatched dining and lounge area sits between two huge baobab trees and is the ideal place to relax after your journey. Sitting here, drink in hand, you'll soon adjust to gentle pace of life. Welcome to Malawi! Full board. 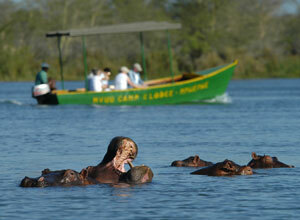 With Liwonde National Park on your doorstep a safari is on the cards today. Elephant, sable, waterbuck and reedbuck abound and sightings of zebra, eland, hippo and buffalo are common, so you're assured of great wildlife viewing. 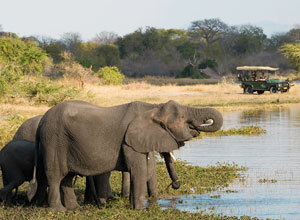 Your 4x4 game drive will take you into different areas of the park to observe contrasting habitats. You should keep your camera close to hand for those classic safari shots! Returning to the camp you can cool off with a swim in the pool and later enjoy dinner under the star-filled sky. Full board. You can opt for another game drive today, exploring another part of the park, or maybe try a boat trip on the Shire River, bringing you into close, but safe, contact with hippo, crocodile and elephant. You'll see lots of birds, too. After lunch and a lazy afternoon in camp, you can set out by vehicle in the late afternoon, stopping for sundowners at a scenic spot. The drive continues after dark. It's a whole new world by night, alive with sound. Your driver will make sure you're back in time for dinner. Full board. Experience a new aspect of the bush with a guided walk this morning. It's surprising how different it feels to be out in the wild, away from the confines of a vehicle, at one with nature. 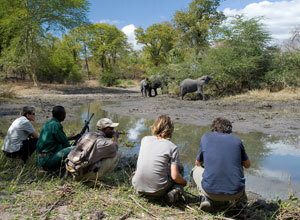 It's a more intense experience and one that allows you to observe smaller animals and plants, as well as large game. Liwonde is home to a sanctuary dedicated to the rare black rhino. With the correct permission you'll be able to visit the project and see not only rhino but also hartebeest and roan, species rare in Malawi. Full board . It's time for a change of scene. Following breakfast you'll be collected by your driver for the 3-4 hour drive to Cape Maclear. Your ultimate destination is Mumbo Island Camp. Mumbo Island is a pristine and deserted natural island, and the undisputed jewel of the Lake Malawi National Park. Here you can relax and enjoy a comfortable stay with unrivalled views of the lake from your simple and charming chalet and the open plan main areas. Full board. 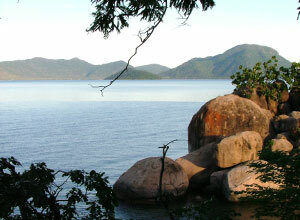 Guests at Mumbo Island Camp have both the lake and the island to explore - water babies will be in their element! Snorkelling and diving are great ways to observe the abundant marine life of the lake or above the water you can try your hand at kayaking, wakebording. There are many lizards on the islands, from large monitor lizards to small colourful varieties. 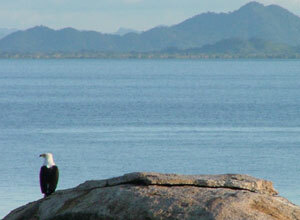 Listen to the haunting cry of the majestic Fish Eagle as they circle the huge boulders of the island hunting their prey! 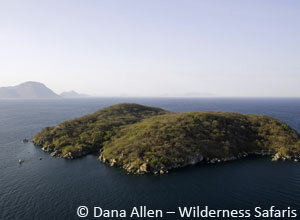 There are marked nature trails around the main island and some lovely look out points. Whatever you choose by the end of the day you'll be ready for your sundowner! Full board. 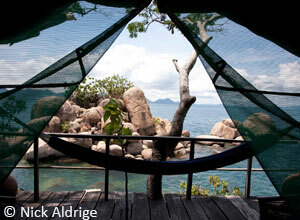 Staying at Mumbo Island Camp is not only about water. It's about getting close to nature, leaving behind the pressures of everyday life and relaxing in what we like to call barefoot luxury. A stay on the island has something of a remote castaway experience about it. The simple chalets built on the rocks seem to blend seemlessly into your surroundings while giving amazing views of the lake as you leave all your cares behind with each sway of the hammock. Full board. Two more days to do as much, or as little, as you like at Mumbo Island Camp! The attentive staff are available to advise on activities and excursions to help you fill you days. Alternatively you can choose to take it easy, topping up your tan and cooling off with the occasional swim. However you occupy your time, a chilled drink at sunset followed by a lamplit dinner overlooking the lake is always the perfect way to end a day. Full board. Enjoy your last Mumbo Island breakfast, looking out over the lake, after which you'll be collected and taken back to the mainland for the 4 hour drive through the Malawi countryside to the airport in Lilongwe, where the holiday ends. Breakfast. 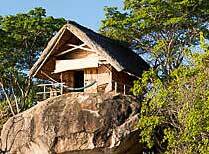 Twin-share accommodation; full board throughout (excluding drinks); road transfers as specified; safari activities at Mvuu Camp; kayaking and snorkelling at Mumbo. International flights and taxes; visas; travel insurance; vaccinations; drinks; scuba diving at Mumbo, items of a personal nature. This holiday starts and end in Lilongwe. Return flights from the UK cost from £800 per person, depending on season and availability. We will be happy to check flights for you. Departure dates: This is a tailor-made holiday that can begin on the your choice, subject to availability. 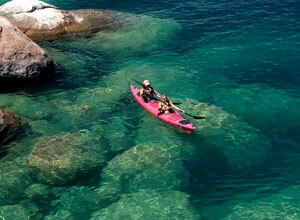 A gorgeous castaway island in southern Lake Malawi. 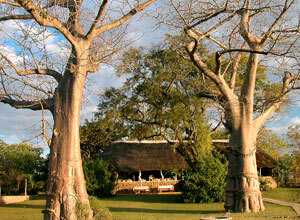 Mvuu Camp is a rustic camp on the Shire River in Liwonde National Park.